That enviable Nokia 808 PureView 41-megapixel camera and its unenviable Symbian operating system could soon be modernized as a new Windows Phone 8 smartphone. Even better is the fact that Nokia is now testing out two versions of the "Eos" smartphone, according to unnamed sources who talked to My Nokia Blog. Nokia is working on a dual core version as well as a quad-core Snapdragon 800 model of the handset, said the blog, which is an unofficial website dedicated to the company's products. The 41-megapixel camera is also rumored to be supported by both an LED and more powerful Xenon flash, and boast an Amoled 1280 x 768 display. While Nokia is reportedly working on a dual- and quad -ore version, there's no guarantee that the company will release both phones. This is because the Eos quad core model "may be facing poor battery performance," mentions the blog. A drain on the speculated 2,000 mAh battery could mean that Nokia will end up releasing only the dual core version of the Nokia EOS. The 41-megapixel camera on this purported WP8-based device is the exciting news, but Nokia fans will also be pleased to know it may have a Micro HDMI out port and Micro SD card slot. 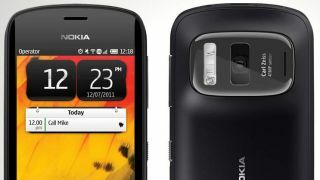 The microSD card slot would be perfect for filling up the large 41MP photos taken with the Nokia EOS smartphone. This 41-megapixel Nokia Eos smartphone doesn't have a release date or price, but the sources said it will be an AT&T exclusive in the U.S. to start. A global rollout is reportedly happening one to three months after that point. With Nokia set to boost the WP8 camera app in July and this phone rumor claiming the Eos will have a "detailed camera interface," your vacation photos may be improved by mid-summer.